Generally, two kinds of acts can constitute bribery. The first kind is conferring, or offering to confer, any benefit to another in return for which the receiver of the benefit will then violate a duty of fidelity to a third party. The second type, of course, is soliciting, accepting, or agreeing to accept the benefit just described. The New Jersey criminal code discusses bribes in two separate places. The first place treats commercial bribes. The second place treats bribes in official or political matters. We discuss both types on this page. In the federal sphere, Congress considers bribes mostly in Title 18, Chapter 11, of the United States Code. Many of those provisions touch upon very specialized situations. For example, 18 U.S.C. 224 deals with bribery in sporting contests. And 18 U.S.C. 226 treats bribery affecting port security. Whether under New Jersey law or federal law, the consequences of offering a bribe, or accepting a bribe, if convicted, are severe. This page covers both New Jersey and federal bribery laws. 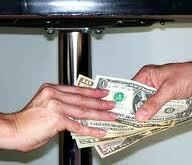 We discuss both types of bribery under New Jersey law. We cover federal bribery generally. While we cover the federal bribery statutes in not great detail, we do provide links to many of them. A person who holds himself out to the public as being engaged in the business of making disinterested selection, appraisal, or criticism of commodities, real properties, or services. The seriousness of the offense depends upon the size of the offer, or exchange. Bribery involving benefits of $75,000.00 or more are crimes of the second degree. 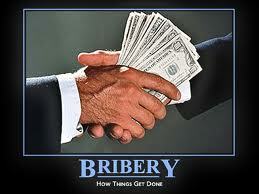 Where the benefit exceeds $1,000.00 and is less than $75,000.00, bribery is a crime of the third degree. All other briberies are crimes of the fourth degree. The New Jersey statute that defines bribery in official and political matters is N.J.S. 2C:27-2. Like commerical bribery, political and official bribery covers both the person providing (or offering to provide) the benefit as well as the person receiving (or offering to receive) the benefit. Measurement of the seriousness of the offense differs. Official or political bribery is a crime of the second degree unless the value of the benefit at issue is $200.00 or less. Where the value does not reach the $200.00 mark, bribery is a crime of the third degree. Benefit as consideration for the performance of official duties. As indicated above, most federal statutes concerning bribes are in Title 18, Chapter 11 of the United States Code. Chapter 11 extends from 18 U.S.C. 201 to 18 U.S.C. 227. Sections 220 through 223 are no longer in use. In addition to Chapter 11 bribery, Title 18, Chapter 9 defines bribery when it occurs in the context of bankruptcy proceedings. More particularly, 18 U.S.C. 152(6) makes it a crime to knowingly and fruadulently give, offer, receive, or attempt to obtain money, property, advantage, or promise for acting or forbearing to act in bankruptcy proceedings. Persons convicted of violating 18 U.S.C. 152 are exposed to a term in federal prison of up to five years. 18 U.S.C. 201 is the federal analog of New Jersey's statute relating to bribes in official and political matters. “Public official” is expansively defined to include members of congress, and officers, employees, and persons acting for or on behalf of the United States, or any department, agency or branch of government thereof, in any official function, under or by authority of any such department, agency, or branch of government, and jurors. And, of course, all of these convictions expose the defendant to stiff monetary penalties. As indicated above, whether under New Jersey law or federal law, the consequences of offering a bribe, or accepting a bribe, if convicted, are severe. Persons charged, or who may be charged with offenses involving bribes need a skilled and understanding criminal defense firm on their side. Allan Marain, Norman Epting, Jr., and Judson L. Hand have the skill and experience to handle charges involving bribes. They offer an initial no-cost no-obligation consultation. They would welcome the opportunity to review the situation. Page last updated 20 August 2017, and displayed Thursday 18 April 2019, at 06:35:37 EDT.